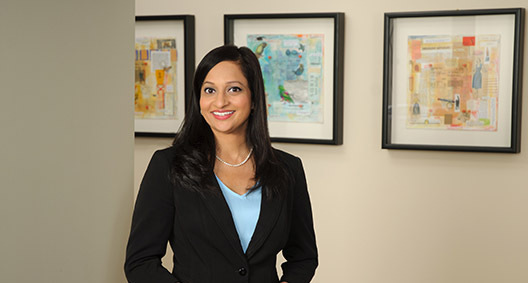 Vimy Devassy provides her clients with an in-depth understanding of the complex compliance and regulatory issues involving the healthcare industry. Vimy has broad experience structuring complex transactions among healthcare providers and negotiating and drafting a variety of contracts for hospitals, physicians and other healthcare providers. She is also thorough and exacting in her approach to managing issues related to confidentiality and privacy of health information, as well as healthcare fraud and abuse issues. Represented several large hospital systems and various large physician practices in responding to significant HIPAA breaches that resulted in no sanctions. Assisted a large hospital system, multioffice physician groups and biomedical companies in developing compliance programs, including robust HIPAA compliance programs. Provides ongoing assistance to a large hospital system in negotiating and drafting a wide variety of contracts, including physician-related agreements, on a day-to-day basis. Advised a multicampus system regarding physician-hospital arrangements and provided transactional representation in connection with practice acquisitions, physician employment, medical director arrangements and other professional services arrangements. Advised private equity clients regarding potential investments involving healthcare providers, including due diligence review and analysis of fraud and abuse issues, licensure and other regulatory considerations.